A Little Time and a Keyboard: Monster Jam is Coming to Chicago's Allstate Arena! Monster Jam is Coming to Chicago's Allstate Arena! Advance Auto Parts Monster Jam is the most exciting form of family motorsports entertainment on the planet. The stars of the show are the biggest performers on four wheels: the Monster Jam trucks! The twelve-feet-tall, ten-thousand-pound machines will bring you to your feet, racing and ripping up a custom-designed track full of obstacles to soar over - OR smash through. 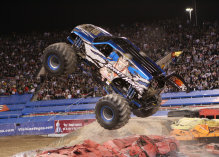 The 2013 touring season brings more Monster Jam excitement with the celebration of Maximum Destruction's 10th Anniversary providing entertainment tailored perfectly for your family's budget, and these colorful, larger-than-life beasts are sure to capture the hearts of both young and old. We sold out all 5 shows last year, so get your tickets EARLY! Playing Allstate Arena Feb. 8-10. CLICK HERE to save 33% off tickets with promo code MOM3. Also, for a little fun, here is a link to some cool Monster Jam coloring sheets to get ready for the big show! **Disclosure: This message is being posted due to our affiliation with US Family Guide on behalf of Feld Entertainment. We will receive tickets for the event for this post and in order to make an accurate review. I know people who love to go to those.